One of the wonderful things about Vancouver is that it offers so many different kinds of tours. You can tour by bus, float plane, train, boat or a combination of these. Here is a run down of your tour options and links to get you to the right place if you want to sign up. Vancouver City Highlights Tour – This tour lasts 4 hours, includes pick up and drop off at your downtown Vancouver or airport hotel and the major sights of the city. 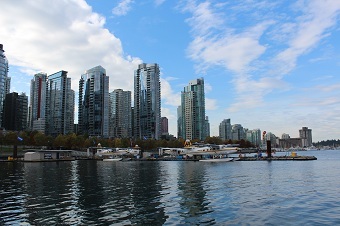 This tour includes 4 stops: Stanley Park (2), Granville Island and the Vancouver Look Out with its 360 degree views of the city. 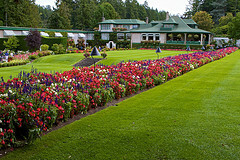 Victoria and Butchart Gardens – This 13 hour tour of Victoria includes both bus transportation and ferry transportation because Victoria is located on Vancouver Island and the only way to get there is to ferry or fly. More about the fly option later on. This tour includes pick up and drop off at your hotel, transportation to the Tsawwassen ferry terminal about 21 miles from Vancouver, 1 hour 35 minute ferry ride from Tsawwassen to Swartz Bay, transportation from the ferry to the Butchart Gardens which are beautiful year round, free time to explore Victoria, one of the most beautiful and English cities in Canada, and a return bus and ferry ride to your hotel. Many people enjoy breakfast in the cafeteria going to Victoria and dinner in the buffet on the way back. Vancouver City and Capilano Bridge Tour – This 7 hour tour includes, besides pick up and drop off at your hotel, both Vancouver’s highlights, without the Look Out, and the amazing Capilano Suspension Bridge and Park with its 450 foot long suspension stretching over the Capilano Canyon, 230 feet above the Capilano River rushing below. Other attractions at the Park include the Cliff Walk over small suspension walk ways and glass floored look outs and the Tree Top Adventures, more suspended walk ways that sway from tree to tree. The Cliff Walk took three years to build at a cost of $5.3 million. It’s built to last, as is the Suspension Bridge that was first opened in 1889. Don’t worry. It’s gone through a lot of revisions since then. You’ll also visit the Capilano Salmon Hatchery, which is very interesting. Whistler and Shannon Falls Tour – This 11 hour tour includes pick up and drop off at your hotel, a drive along the spectacular Sea to Sky highway as it hugs the coastline from Vancouver to Squamish, with stops along the way. En route to Squamish, you’ll stop at Shannon Falls, BC’s third highest waterfall. Watching the water fall around you is exhilarating and literally breath taking. When you arrive in the village of Squamish, you’ll stop at the Lil’wat Cultural Centre with its exhibits, movies and gift shop. 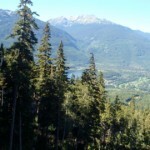 Then its on to Whistler, your final destination. 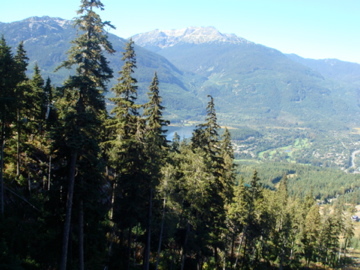 Whistler, site of the 2010 Winter Olympics is one of the most popular winter ski destinations and summer playgrounds in North Amverica. In Whistler, you’ll find high end hotels and restaurants, cozy cafes, excellent shopping, zip lines, mountain bikes and riders and beauty wherever you turn in this pedestrian only village. You’ll have free time to explore Whistler’s shops, trails, chair lifts, zip lines and excellent restaurants. Grouse Mountain & Capilano Bridge Tour – This 6.5 hour tour with pick up and drop off at your hotel includes both the Capilano Suspension Bridge and Park AND Grouse Mountain. 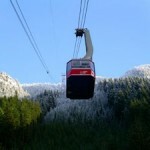 You’ll start with a quick transfer from downtown Vancouver to the base of Grouse Mountain where you’ll board the Grouse Mountain Skyride for your 8 minute ride to the top of the mountain. 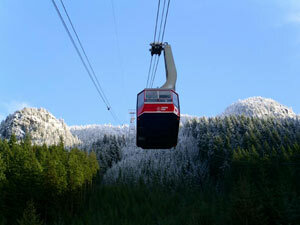 In Winter, Grouse Mountain has snow, entertaining movies about the area, excellent restaurants, two orphaned grizzly bears, if they aren’t hibernating, and ice skating. 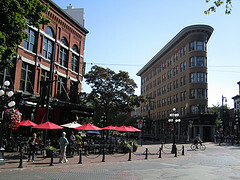 If you don’t have time for a 4 hour or longer tour, consider one of the Hop On, Hop Off Vancouver bus tours. They pick up and drop off at convenient locations around the city year round. If you don’t feel like getting off the bus, you can get a snap shot of the city in two hours.